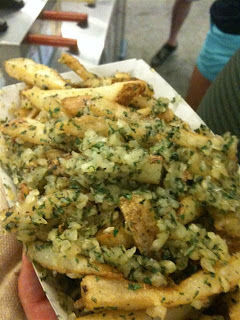 I went to the Yankee game on Tuesday (we realized we had a pair of tickets to the game 20 minutes before it started) and decided to try out the Garlic fries. Whoa!! These guys are intense! Now I am a garlic lover so when I saw all that luscious chopped up goodness on top I was psyched. I chowed down on some fresh off the top and was quite a happy camper. Then somewhere around bite number four or so the strong taste began to get to me. I started to feel little overwhelmed with the flavor so I dug down below to find some that were plain. That’s when I realized- there were no plain!! The entire box was uniformly covered in garlic from head to toe. 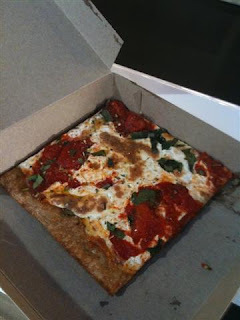 I was a little shocked and both Mr. T and I could not see eating this whole on its’ own. So we decided to do what any food loving couple would do. We went over to Lobels and ordered one of their Steak sandwiches so we could enjoy the garlic flavor with something a little more substantial. It ended up being awesome. Ahhh Mercadito Grove….Remember this place? The one with fantastic fish tacos but surley and unprofessional service? Well I retuned against my better judgment the other day. I had been craving fish tacos and we were meeting friends later at Blind Tiger. It just made sense since they were nearby. So Saturday afternoon we walked down to 7th Avenue South for brunch. The hot humid weather gave way to a sun shower and by the time we arrived we were both quite soaked. We got a seat at the front table and drank in the air conditioning above. Even though it had rained we were still sweating from the thick humid air. I knew I wanted fish tacos and Mercadito has a $15 brunch special that includes the tacos and a drink. Mr. T got an orange juice and I went for a mimosa. The waiter asked me if I wanted any fruit flavor added to my drink. I wasn’t sure what he meant by that but I decided to go with Strawberry. My drink came and there were pieces of strawberry floating on the top. 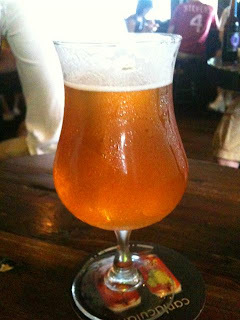 Blind Tiger had a ton of Sly Fox beers on tap last weekend and a couple really stood out. One in particular was the Sly Fox Incubus. This is a Belgain style Tripel that poured with a fair amount of head and a bready sweet aroma. Since this beer weighs in at 10.3% alcohol, I couldn’t believe how drinkable it was! It had a very sweet taste, almost like honey that was rounded out by a slight spicy kick on the finish. 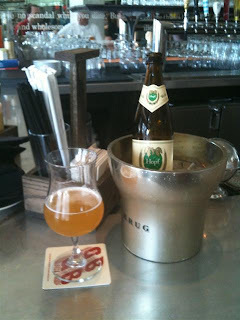 A very nice beer I would get again. Unfortunately the other two Sly Fox beers I had were not very good at all. The Oktoberfest had a strong skunky taste to it and the Sly Fox Grisette was just plain weird. It poured slightly darker than a glass of pineapple juice and had almost no beer flavor. Everyone at the table tried it and not one person thought it tasted good. It is possible however,. that all the strong beers before trying this might have damaged our palettes a little. Maybe I’ll give it another shot. We stopped in for a quick drink Friday night at the new Russian spot Mari Vanna. I had been pretty devastated when the Silver Swan closed down and this prime real estate across from Gramercy Tavern sat empty. Luckily they kept some of the charm of the Silver Swan but gave it quite the makeover. The inside reminds me of going to visit an old and wealthy relative who has never changed the decor. From the garden out front to the white linen tablecloths and antique cutlery, I definitely did not feel like I was in New York City anymore. Apparently you are supposed to be buzzed inside just like a residence as well. However the warm weather called for open doors, so we just breezed right in and took a seat at the bar. I asked to see the drink list and I was struck by how many different kinds of beer they had listed. 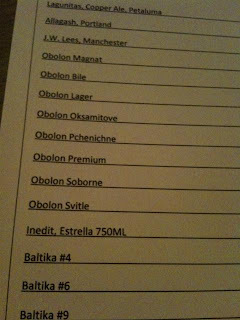 I’ve had all of the Baltica’s before (and loved them) but I had never had any of the Obolon’s. Saturday we spent with friends touring around the city from Sardi’s in the Theater District all the way down to the NYU part of town on MacDougal Street. We tried to pretend like we were in college again and played some beer pong at Off the Wagon. You know what I discovered? I am NOT in college anymore and I can not drink that much. So after 2 short games I was a little tipsy and ready for some serious food. We walked outside to get a cab over to the East Village when I remembered Minetta Tavern was right next door. I’ve tried to get into Minetta Tavern a bunch of times now. Every time we walk by I stop in and ask if there’s a table and I’ve called for a reservation at least 4 or 5 times as well. Every time my request is answered by the same response- “We have an 11:30 available”. Okay I don’t know about you but I’m thinking about sleepy time around 11:30 not a big meaty dinner. Our old college friends were visiting this past weekend and we had basically a non-stop party. They got in late Thursday night and we went out for Thai food in our neighborhood. Friday we awoke and felt like the same type of food! So we ended up at Sea Thai in the meatpacking where we proceeded to walk the Highline. The true reason for the friends visit, besides to see us, was to go watch a Mets game. Yes, my friends are Mets fans and that’s okay! So we headed to Citifield for the first time this year. I love baseball but I was mostly excited about the food this time since the Mets aren’t exactly doing so well. We got to the stadium and after about the third inning we headed over to Centerfield where all the fancy concessions stands are- Blue Smoke, Shake Shack, Box Frites, etc. Sunday afternoon I was having a serious craving for some Chinese food. I wanted to go somewhere a little nicer than our usual Chinatown joints since I was still in a celebratory mood. Luckily Chinatown Brasserie fits that bill exactly. We've eaten there 3 or 4 times before and always had a good meal even if it was a lot more expensive than Chinatown. Sometimes you pay for the atmosphere. Another good reason to head here is for their drinks! 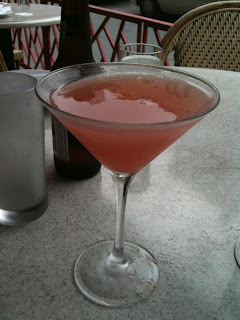 We got seated at a nice table outside and I ordered a Bellini Martini. Now I had just had a fantastic regular Bellini the day before at Onda so maybe I was expecting something just as good but this cocktail kind of fell flat. It was strong, that's for sure. I could really taste the vodka and peach but it had no balance. It was like drinking sugar flavored alcohol water, not a cocktail. For $10 I want a cocktail. Chinatown brasserie was doing its' restaurant week menu but we decided to go a la carte. Mr. T ordered a Won Ton soup to start. 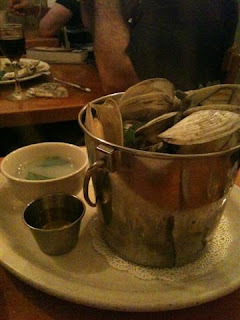 Return to Pearl Oyster Bar and A Big Surprise! So after our wonderful brunch at Onda on Saturday we spent the afternoon walking around the Seaport and enjoying the weather. We checked out the newly opened Water Taxi Beach. It’s kind of neat but kind of weird with people hanging out in bikini’s left and right. I mean it is a fake beach but it’s right near Wall Street right? Then it was time for the Yankees to play the Red Sox so we hopped in a cab and headed to the Blind Tiger to watch the game and enjoy some good beers. Now the plan had been to go to Blind Tiger and then run over to Pearl Oyster Bar at some point to put our name on the list. So about 6:45 I decided to check it out. I didn’t see any line while I was walking but I was still nervous. Pearl is ALWAYS packed. After spending a ridiculously long time at Yankee stadium Friday night watching the 15 inning game, we awoke to a beautiful Saturday morning with absolutely nothing to do. It was such a sunny day we decided to head down to the Seaport and walk around a little and find a brunch place. We walked off the main drag on Front Street and stumbled upon Onda- a new Latin place. It looked kind of interesting and there was a nice table outside that was available so we stopped in. 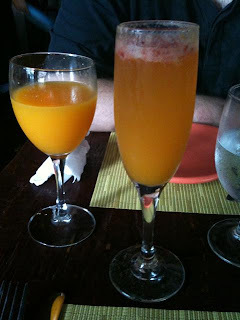 They had a special going that day for $4.00 Mimosas, Bloody Mary’s and Bellini’s. 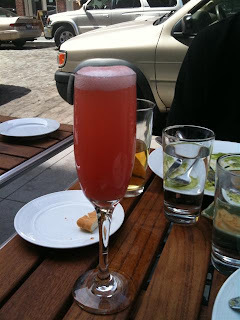 I can’t turn that offer down so I ordered a very nice and refreshing Strawberry Bellini. Look at that color! They used fresh strawberry puree and it really made the cocktail wonderful. I could have drank about 10 of these things! It was Mr. T’s birthday this past week and we celebrated by having three nights of good food and drinks. Thursday night we I took him out to his favorite Japanese place in the city- Sushi Yasuda. We sat at the counter right in front of Yasuda himself and enjoyed piece after piece of utterly delicious sushi. I swear there is no better fish in the city and Yasuda’s laugh alone is reason enough to go! Friday we braved the rain storms and made our way to Radegast in Brooklyn to celebrate with friends. If you know anything about me it’s that I love, love, love German beer and beer halls. Radegast is huge compared to my favorite Zum Scheinder and has a ton of fantastic beers. The last meal of Mr. Pruner’s visit and he still hadn’t had a burger. The one thing he said he really wanted to get on this trip was a good burger and I hadn’t produced yet. I was planning to take him to Prune for their English Muffin bonanza of beef on Thursday, but his plane was delayed and we lost our reservation. Now it was Saturday night and I wasn’t sure what to do. Our three person group had grown to seven and everyone was looking to toss back some beers and chill out. It was such a nice day the Stoned Crow seemed too underground, PJ Clark’s too far away, Shake Shack way too long a line. 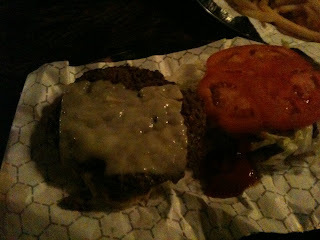 Then I thought of Royale, one of my favorite bars to grab a great burger and sit outside with some beers. We hopped in a cab and headed to Royale only to find out they were closed for a private party. Drat. 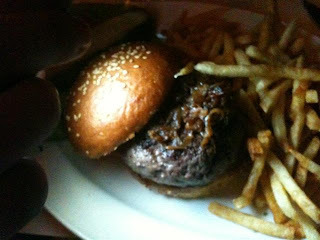 We had taken a cab all the way down to Alphabet City and our only burger and beer idea was shot. Saturday morning I awoke with the hugest craving for bacon and eggs I’ve ever had in my life. Sometimes I get carvings like this and they won’t go away until the need is met. I actually start to feel a little crazy if it lasts too long. Anyway- I anxiously awaited the arrival of my other friend and once she got in the city we headed to PS 450 for some brunch. PS 450 is basically a bar but I heard it had some good brunch specials so I thought we’d try it out. I would love to find a brunch place where I can get some good food and be able to watch some sports on TV. Walking into PS 450 one of my requirements was met immediately- two plasma TV’s right above the bar. Perfect. Once we were seated they brought us over a nice little basket of baked goods to start. Mini muffins, cornbread and biscuits were accompanied by two different jams and some butter. 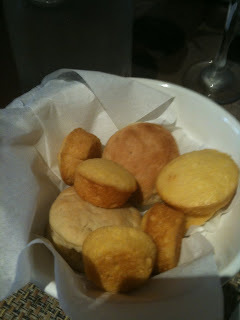 The biscuits were a little dry but the mini cornbread and muffins really hit the spot. I love it when brunch starts with some free pastries!